As green gave way to rugged desert, the reality of vacation hit us both. We were in for a week of exploration, relaxation and pure enjoyment. Our former epic vacation had taken us inland and just shy of San Diego so this was a new frontier that we were eager to explore! Stepping out of the airport into the balmy 27C sunshine we knew that this vacation was going to be spectacular. What we found immediately was that San Diego was full of friendly people, we easily grabbed our hotel shuttle and within minutes we were checking in. We stayed at the Holiday Inn Old Town and what a great deal. The hotel is clean, has a great pool open until 10pm and serves a decent free breakfast every morning. 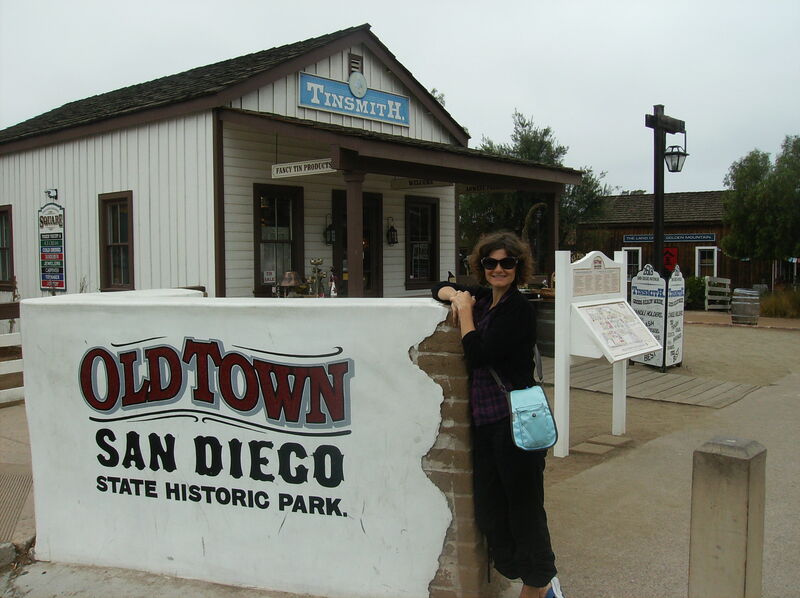 We were about a 5 minute walk from the heart of Old Town and 8 minutes from the trains, trolley and buses that are all at one stop called “Old Town. The staff at the hotel were outstanding and really went above and beyond to help their guests feel at home immediately. So we dumped our gear, put on our sandals and headed out into the Old Town. The Old Town is a State Park and on this particular day there was an art festival and the whole downtown was full of the vibrant colours of canvas, the smooth lines of glass and stone sculptures and the glint of sun hitting handmade jewels. All the buildings in Old Town are functional museums, shops and restaurants. You can make your own candles, watch taffy being made, and tour the first jailhouse in the town. My favourite place was the Mormon Battalion Memorial Visitors Centre. The Mormon Battalion arrived in San Diego in January of 1847 to support the American military garrison in the pueblo during the Mexican War. Five companies totaling over 500 men had been mustered in at Council Bluffs, Iowa on July 16, 1846. Along with 32 women, they made the longest march in military history consisting of 2,000 miles from Council Bluffs, Iowa, to San Diego. The tour takes about 45 minutes and uses interactive technology with live interpreters to make the Mormon journey come to life. It was definitely one of the best museums I have ever seen and the use of technology to tell the story was absolutely phenomenal. Since Darek wasn’t as interested he hung out on the wide veranda on a rocking chair and fell asleep in the warm rays of the October sun. 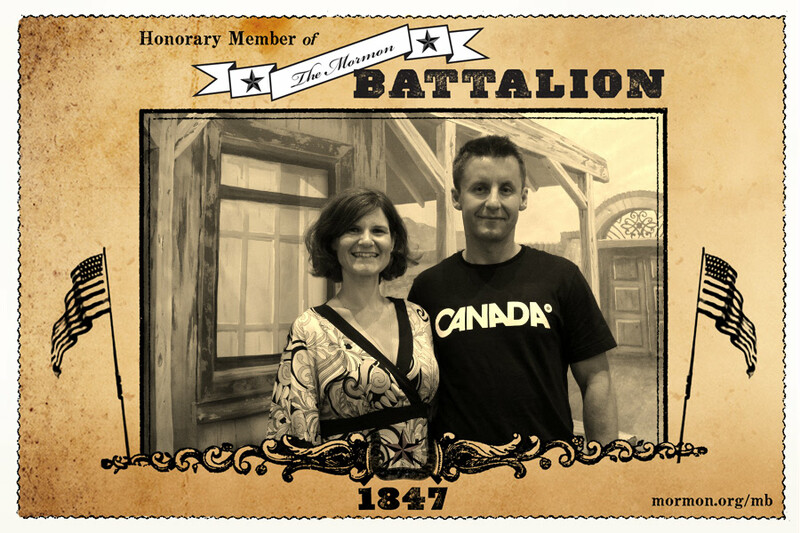 We even got our picture taken as honorary members of the Battalion! While this interactive museum is run by Mormons and there is an obvious religious message, it is not an excuse to press religion on people and I found the whole experience very respectful and eye opening. There are guided tours for the whole Old Town if you want to take the time, I found out all the info I needed to know on http://www.oldtownsandiegoguide.com/ and http://www.sandiegohistory.org/links/oldtown.htm and was able to guide us through the coolest points in Old Town. I would love to be in Old Town during the Dead of the Day festivities, some merchants were already setting up stations and it promises to be a pretty amazing day. Speaking of the dead…the Old Town is famous for its ghosts. You can join a ghost tour every night and I was talking to one of the merchants who said that sightings had been up in the past week as Halloween and Dead of the Dead looms closer. I really would rather do anything than hunt around for ghosts but by the end of our stay in the city the Old Town was full of ghost hunters! We spent the afternoon enjoying the architecture, learning the history and basking in the sun. As we walked toward the end of Old Town we found a trail and decided to follow, after a quick climb we ended up in Presidio Park. Presidio Park is a place deeply steeped in history, used by the Tipai-Kumeyaay peoples, the Spanish, the Mexicans and the Americans. The attractive building is a museum, the Junipero, named after the Franciscan friar who led the religious portion of the expedition to California (that resulted in the founding of 21 missions spread out–a day’s journey apart–between San Diego and San Francisco.) Presidio Hill was also the site of the original 1769 Mission San Diego, which soon moved to its own site further inland. 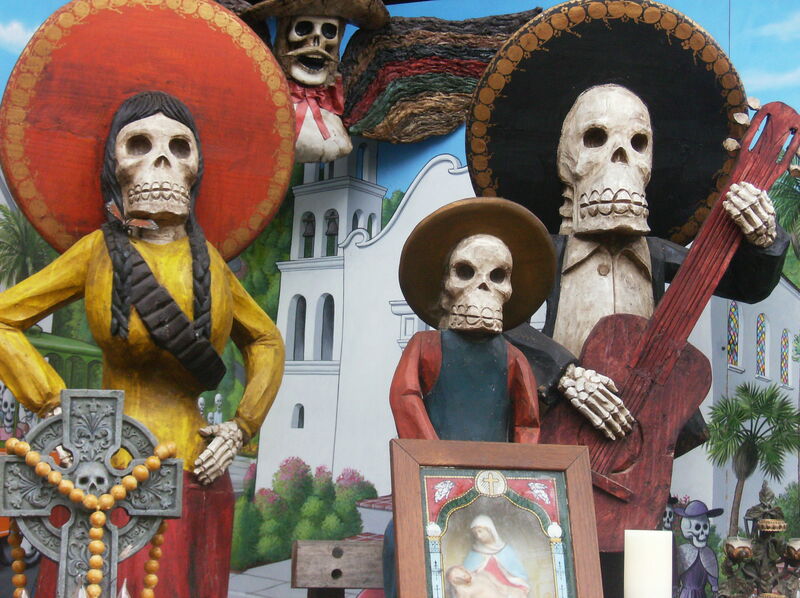 Inside the Serra you’ll find artifacts relating to various periods of San Diego’s history. The Park offers great views of the city and it was a fantastic place to watch the waning rays of the sun meet the ocean. 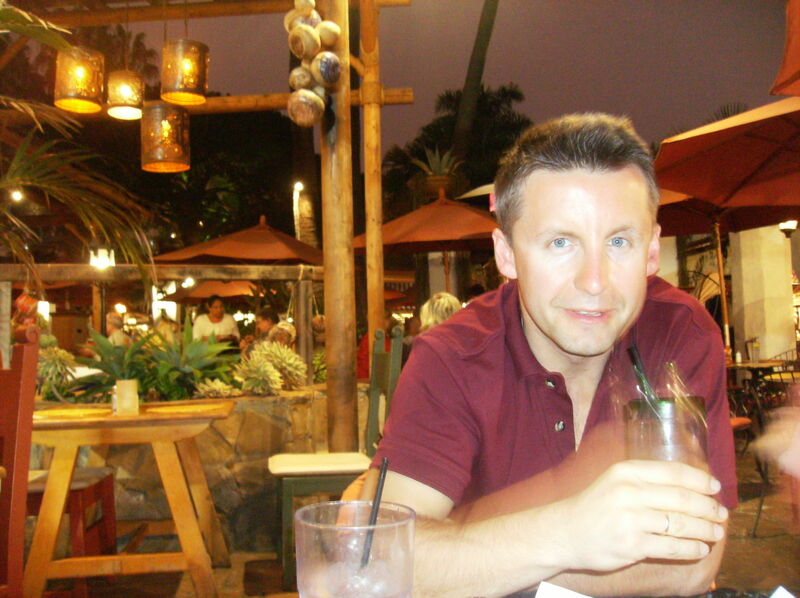 As night descended upon Old Town we found the cheapest place for a margarita is Barra, and that by the way, is not a bad way to spend a lazy Sunday evening!! This entry was posted in California Coast. Bookmark the permalink.